Cebu Is a Beauty | A Cebuana Lifestyle Blog: Shen's Addiction: Shen's Addiction 3rd Anniversary Giveaway! 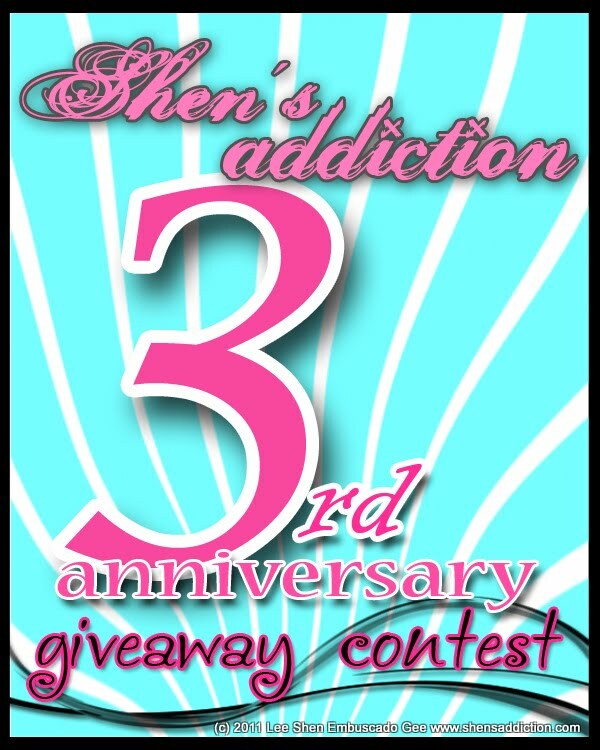 Shen's Addiction: Shen's Addiction 3rd Anniversary Giveaway! I love giveaways! I have a tab especially dedicated to awesome ones I come across online. Shen was one of the first few beauty blogs I followed when I started my own thing in the blogosphere. Now she's doing this covetous beauty giveaways that you beauty junkies out there simply cant ignore! ^^ Shen's addiction has also become mine! all you have to do is do follow the Mechanics. (read the rest of Shen's post for a surprise!)" by the way, Just followed you through GFC. I hope you follow me back.